How Are Things Working Out With Child Care? What’s It Like to Be 8 Months Old? How would you feel? A little frustrated, you can bet! That’s how your baby feels at this age. She is very curious and wants to find out about all the fascinating things that are around her. When you find yourself saying no, give your baby a one- or two-word reason. This helps her learn why she cannot do certain things. Tell your baby what you want her to do instead. Research shows that this really helps. If your baby tries to touch the hot oven, say “Hot,” and move her away from the stove. As your baby gets older, you can make explanations a little longer — three or four words instead of one or two. Your baby’s memory is not the same as yours. Remember how many tries it took her to learn pat-a-cake and peek-a-boo? You will have to tell your baby again and again how to behave and handle situations the way you want. Show the world to her, lovingly and safely. Be your baby’s guide while she looks at, explores, and satisfies her curiosity. I pull myself up by holding onto furniture, but I have trouble getting back down. I stand up if I lean against something. I sit without support for several minutes. My neck and back are getting stronger, so I can sit up straighter now. I hold onto a toy, such as a rattle, for several minutes. I reach for things and hold them with my thumb and first and second fingers. I pick up small things, such as pieces of string. I let you know if I am happy, sad, or scared by the sounds that I make. I still babble a lot and shout to get your attention. I am now an “advanced” babbler, which means I’m making sounds in my family’s language. Spanish babies “speak” Spanish; Russian babies “babble” in Russian. I watch and try to copy the way your mouth moves. I like to pat and kiss my reflection in the mirror. I turn and listen when I hear familiar sounds such as the telephone ringing or someone saying my name. I love to imitate people I know. I am very curious and want to explore everything. I empty drawers, tear magazines, and turn things topsy-turvy. Move everything that can harm me. I know how to solve simple problems, such as making a toy bell ring. I remember events that just happened. I like to look at pictures and have you name what’s in them. I am frightened by new events and new people. I am upset when you leave me, even if it’s for a short time. I feel so relieved when you return. I’m upset when people make a lot of fuss over me. I get frustrated or lose my temper when I can’t find something. 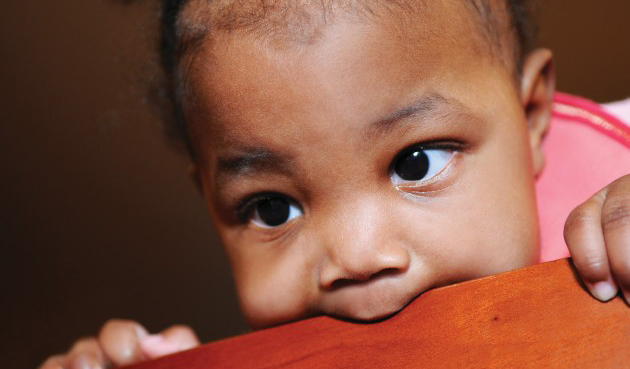 With patience, you can help your baby learn to like many different foods. Remember to start one new food at a time to be sure it doesn’t cause allergies. 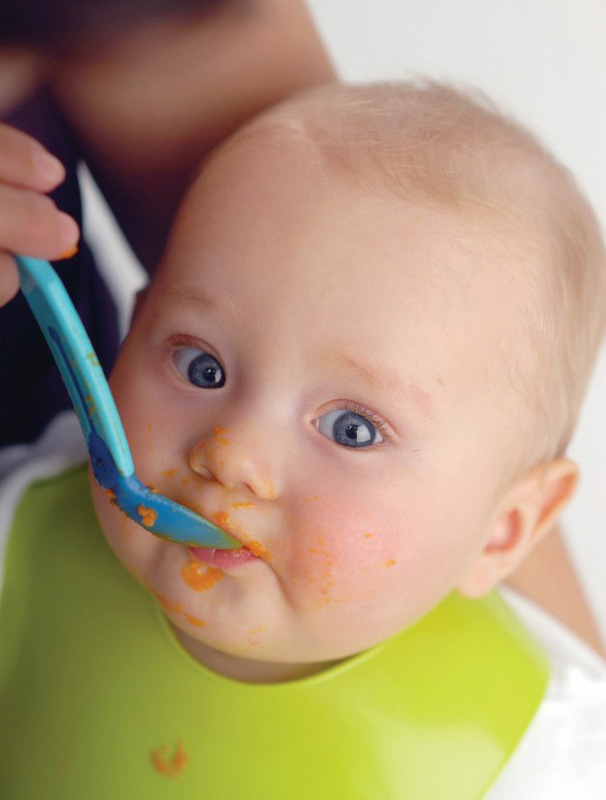 Your baby may have some teeth and may be ready to try forkmashed vegetables and fruits. Mash a favorite vegetable thoroughly with a fork. You could also use a potato masher, blender, or food processor to mash ripe bananas, cooked apples, winter squash, sweet potatoes, and carrots. 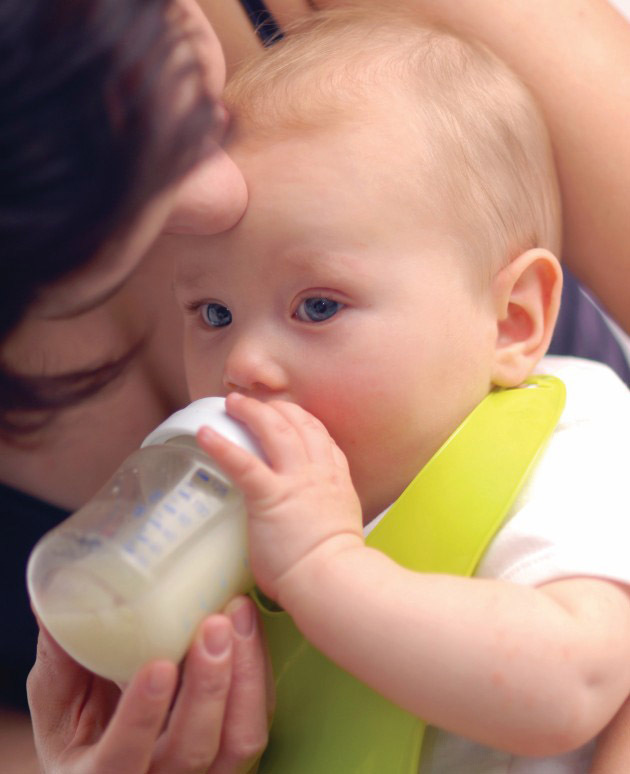 Make sure your baby’s food contains no lumps, pieces of skin, strings, or seeds. The mashed food can be a little thicker than pureed food. Cooked foods may be strained through a fine mesh sieve or strainer. A sieve can also be used to steam-cook small amounts of food for your baby. Press the food through the sieve or strainer. This gives the food a very soft consistency. Be sure that all food particles are removed when you wash the strainer. My baby has suddenly become scared and shy of strangers. She sometimes cries, even when my mother comes to visit. Why does she act this way? What can I do to help her overcome this fear? First of all, don’t worry. A fear of strangers at this age is normal. Babies are beginning to develop a sense of self and others — an important step in growing up. Your baby now knows the difference between close family members and strangers. Sometimes your baby will just stare at new people, watching them closely. Other times, he will look at a new person, and then look away a few times before warming up and smiling. Some babies howl or whimper with genuine fear. Others cling to their parent and refuse to let go. 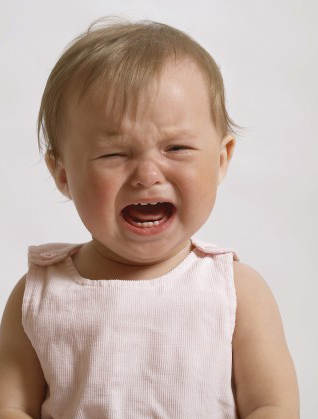 Some babies, just like adults, develop an instant dislike for a person. Usually, your baby is afraid of what the stranger does rather than who the person is. Try to see this from your baby’s point of view. You don’t want a stranger hugging you, and neither does your baby. So, don’t just hand him to someone he doesn’t know well. Hold him while he gets to know the person. Have the new person smile and talk to him, and perhaps offer a favorite toy. Let your baby make new friends at his own pace. However she reacts; comfort your baby if she is fearful of strangers. Hold her close to you and let her know that she is safe. Tell friends or relatives not to take it personally that your baby needs time to get used to people. Ask them not to rush up to her or try to pick her up. Grandparents or friends may have a hard time understanding why your baby gets upset when they pick him up. Assure them that it will be worth the effort to get acquainted slowly. As your baby gets older, he will feel more secure and more comfortable with other people. No baby should be spanked or slapped. Spanking a baby is dangerous. Many babies are injured this way. Family members may tell you to spank your baby so he won’t be spoiled and will know you’re the boss. This is not true. We are learning new things about babies all the time, including what discipline works best. So, the information in these newsletters might be different from what your parents or neighbors were told when their children were little. Babies are too young to understand, so they don’t learn from spanking. It just makes a baby cry more, and it will make you feel bad. When your baby does something you don’t like, show him something else he can do instead. Show him a better way. Your baby may upset you by waking you up at night, crying a lot, or messing a diaper just as you put it on. Remember: Your baby doesn’t do this on purpose to make you mad. Your baby doesn’t think that way. He can’t help it, so it doesn’t help for you to get angry. Call a friend and ask what she would do. Ask someone to watch your baby while you get some fresh air. You may come back with a new outlook on living with your baby. Many 8 month-olds have trouble settling down to sleep. They’re so excited about sitting, crawling and exploring that they don’t want to go to bed! Put your baby to bed at about the same time every night when he is drowsy, but awake. Spend time cuddling, reading, singing or talking to your baby. Help her slow down and relax with bath time, gentle massage and book reading. Doing the same thing in the same way helps children settle down to sleep. Being sure your child gets plenty of cuddle time during the day will probably help him sleep better at night — according to recent studies. If your baby cries after you’ve put him to bed, check on him, but keep the lights dim. If he is OK, pat his back for a minute or two, and leave. If he continues to cry, check on him every few minutes until he falls asleep. Slowly increase the time between your checks. Try to be understanding, not angry. Show him you are there for him, but that he must fall asleep on his own. If you are consistent, he will learn to sleep on his own by learning how to comfort himself. Safety note: Remove the strings or ribbons from the toys when you and your baby finish your play session. Put the keys back and see if your baby can pull the string to get the keys. This is a good high chair game if you tape the string to the high chair. Tie strings, no longer than 6 inches, around other objects that are large, small, heavy, or light. Let your baby try to pull each one. Place toys on a towel so your baby has to pull the towel to get the toys. Put toys in a box. Turn the box over. Does your baby lift the box off the toys? Create simple problems for your baby to solve. Tell your baby how wonderful she is for solving the problem. 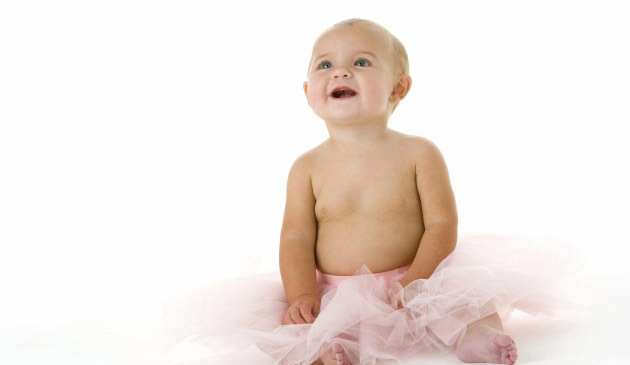 Watching and learning: Babies learn by imitation, copying what they see other people doing. You will see more of this in the months to come. Hiding things: Let your baby watch you as you hide a small toy under a cloth or cup or in your pocket. Does she try to find it? If not, try covering only part of the toy. Music fun: Your baby will enjoy listening to many kinds of music. Show your baby how to clap and move her body to the music. As your baby learns to stand and walk, those movements will turn into dancing. DO NOT add salt, sugar, or seasonings to your baby’s foods. Foods that taste bland to an adult are a new taste experience to an infant. There is enough natural sodium in foods. DO NOT feed honey to your baby during his first year. Honey may carry botulism spores that can make him sick. DO NOT use leftovers to make baby foods. Leftover foods are likely to have more bacteria than freshly prepared foods. This could cause your baby to get food poisoning. Use fresh, frozen, or canned food. If you use frozen food, buy the one with the least amount of added sugar, salt, and fancy sauces. These are not good for your baby. DO NOT feed your baby raw eggs or raw milk. Raw milk is milk that has not been pasteurized. These raw foods can be dangerous for him. DO NOT feed your baby chunky foods such as corn, nuts, popcorn, and seeds, or coarse-textured foods (such as cookies) that crumble easily. Your baby could choke on these foods. Beets, spinach, turnips, and collard greens contain too many nitrates for your baby. DO NOT feed him these foods yet. Commercially prepared baby food for these vegetables may be safe, but it’s best to avoid them right now. DO NOT get your baby’s food too hot. Your baby’s mouth could be burned by hot food. If you want to warm your baby’s food, do it just before serving. NEVER leave your baby alone while he’s eating. He may choke or try to climb out of his high chair. Researchers have learned that babies who go to child care still bond most closely with their parents. Even so, it is better for babies to have the same caregiver every day. Babies in high quality child care are just as smart as babies whose parents care for them at home. Unfortunately, some child care providers are not providing quality care. It’s important for caregivers to like taking care of babies, to smile often, and to talk while dressing and feeding your baby. Babies should be kept clean, dry, and comfortable. They need to hear gentle voices and cheerful sounds. They need to receive lots of praise. Infants should have their own separate space for eating, sleeping, and playing. Centers with lots of infants should divide babies into smaller groups so they feel more secure. The environment should be bright and cheerful. Cribs, high chairs, playpens, and toys should be clean and in uncrowded spaces. Good caregivers wash hands carefully after diapering, dressing, and feeding each baby. They are careful that bottles and cups are not shared among babies. Babies are moved to different play areas and given different toys so that they have lots of chances to move around and explore. They need time for peace and quiet too, but it’s not a good place if babies are kept in cribs or playpens for long stretches of time. Your baby needs someone who respond to him quickly and gently, someone he can learn to trust. Enough adults should be on hand to cuddle, play with, and hold the babies for bottle feeding, but they should not hold and carry the infants all day. If you are not happy with the care your infant is receiving, it may be time to find another caregiver. Variety is the spice of life, but babies need consistency. They like routines or doing the same things every day. If your baby has a bunch of child care providers, it may be hard to form close bonds. Your baby needs someone who responds to him quickly and gently, someone he can learn to trust. There never seems to be enough time to do everything you feel you need to do. It is important to prioritize and do what must be done, which includes taking care of yourself. Plan time for yourself. The fun and trials of having an 8 month-old in your life may cause you to feel tired at times. Swapping baby sitting time with friends can be a way to arrange for some important get-away times for you. Get enough sleep and exercise. It is part of taking good care of yourself so you feel rested and refreshed.